Daily Forex Market Preview – Lack of any clear fundamentals yesterday from the US or the Eurozone saw the markets trading flat for the most part. The yen got a boost with some strong rhetoric from Japan’s finance minister which now see’s USDJPY trading above 108. Watch for a potential dip and a higher low to confirm further upside bias as USDJPY is likely to recover above the 108 levels for a move to 110 and 112 initially. EURUSD (1.13): EURUSD was trading in a small range yesterday following the doji pattern last Friday. Trading at the support level of 1.14 – 1.1380, EURUSD could possibly extend the declines if the support gives way with the next main support noted at 1.1217. To the upside, if the current support at 1.1380 holds, EURUSD could retest the resistance level at 1.14975 – 1.150, but the upside gains could remain limited, leaving EURUSD vulnerable to potential declines in the near term. 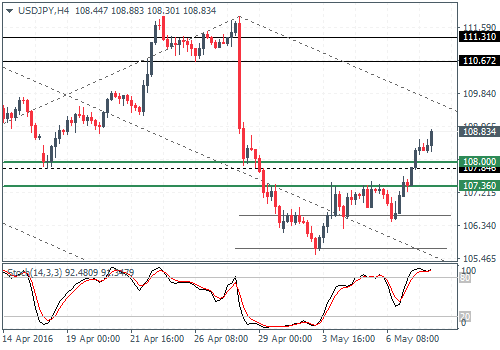 USDJPY (108.8): USDJPY managed to break above the minor support at 108 and continues to push higher. The hidden bearish divergence remains in play which opens the downside risk. But with 108 level being cleared any corrections are likely to be limited near 108 with the possibility of a dip towards 107.36. Forming a possible higher low on the dip could confirm the upside bias in USDJPY, which we expect will see a potential rally towards 110 – 112.0 levels in the medium term. GBPUSD (1.44): GBPUSD formed a spinning bottom pattern yesterday coming after nearly four days of consecutive declines. 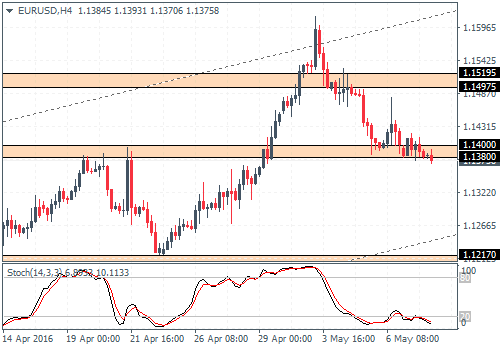 With the pattern formed just below the 1.4425 support, we could expect to see price action either breakout to the upside which needs to be confirmed with a daily close above yesterday’s high of 1.4480 or the low at 1.4374 for a move to 1.420. 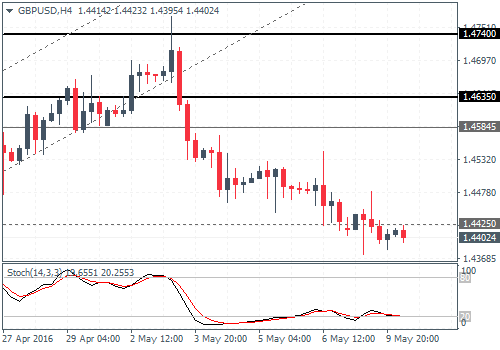 On the 4-hour chart, price action is seen consolidating near the 1.4425 support level with resistance at 1.45845 – 1.4635 a level most likely to be tested on an upside breakout. 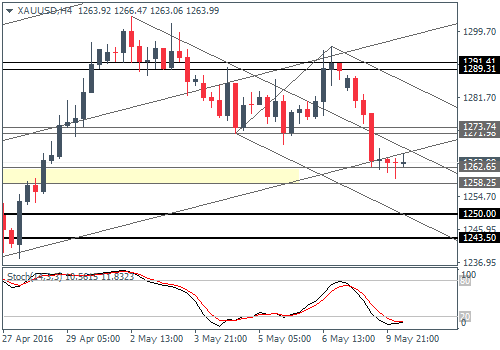 XAUUSD (1263): Gold prices posted a strong decline yesterday, and the bearish momentum is likely to see further downside in gold. On the 4-hour chart, the failed bullish pennant pattern saw price action stalling near the previously broken support level to establish resistance at 1291 – 1290 before prices fell sharply to the lower support at 1262 – 1260 levels. If the current support holds, gold could attempt another rally towards 1273 – 1271 which marks a minor support level that was broken. Establishing resistance here could confirm further downside, but if prices break above this level, another retest to 1290 is likely.